The Cardiovascular Surgery Department of the Hospital Clínic de Barcelona led by Dr Manuel Castellà has, for the first time, performed two heart transplants simultaneously. Although only one of them was planned and two heart transplants had never been performed simultaneously, the result of both surgeries has been “very satisfactory”. For the past few weeks, the hospitalization ward of barnaclínic+ has a new real-time information system for relatives of surgical patients. EstimTrack is a tool that aids monitoring and provides information at all times of the surgical process and the condition of the patient being operated on. This information can be consulted from the screens of the Hospitalisation Room or from any mobile device, thanks to the application (Available for Android and iOS). The New barnaclinic+ Paediatric FASD Unit (UneSAF) offers diagnosis and follow-up for children affected by Foetal Alcohol Spectrum Disorders. Made up of a multidisciplinary team of leading experts, on a national and international level, with over 15 years’ experience in FASD-related treatment, teaching and research. Furthermore, it is the only Unit in the country to specialise in this disease and offer diagnosis and psychological (cognitive-behavioural), speech therapy and educational treatment, among others. 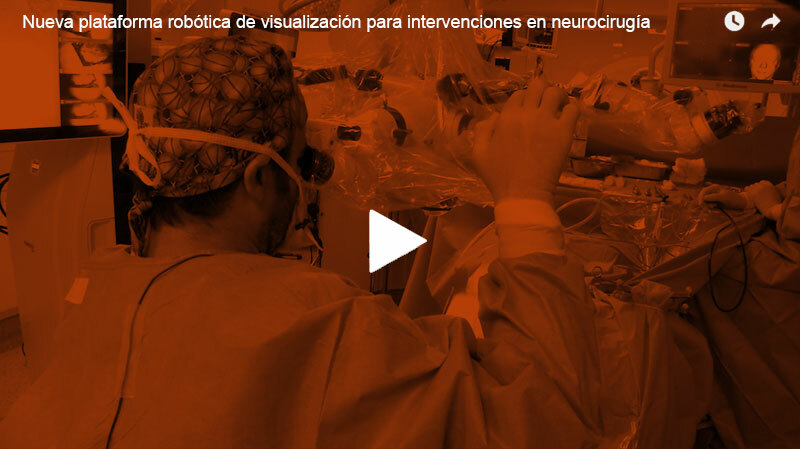 Thanks to a donation from barnaclínic+, the Hospital Clínic Group has become the first centre in Catalonia and one of the first in Spain to benefit from a new state-of-the-art robotic visualisation platform. This new surgical microscope incorporates a range of functionalities that facilitate intelligent positioning by the surgeon, reduce manual movements and allow better visualisation of the area of the brain being operated on. What is more, with this technology come shorter recovery times and better prognoses for neurosurgery patients.